Do you want to learn how to grow an edible garden? I have been growing food for over twenty years. As a gardener, there have been ups and downs, and I am constantly learning, but none of my gardens have ever been a complete failure. There is always something to eat! 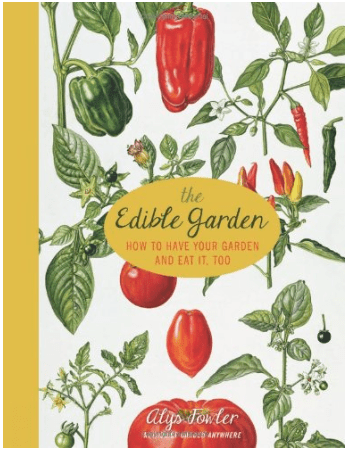 [amazon_link id=”1936740540″ target=”_blank” ]The Edible Garden: How to Have Your Garden and Eat It, Too[/amazon_link] by Alys Fowler is an amazing, beautiful book! It is a guide for anyone that wants to create and edible garden in any space they habitat. Whether you are a hardy homesteader or just getting started with a few herb pots on your windowsill,The Edible Garden offers food for thought on creating your very own haven that is as beautiful as it is delicious. Master gardener and BBC personality Alys Fowler has devoted her life to teaching people how to grow their own floral food and edible landscaping. Here, Fowler shares her trademark wisdom and inventive tips to help your garden grow abundantly—from saving and sowing your own seeds, to mixing the world’s best compost, to brewing your own herb teas and growing such a bounty of veggies that you will have to learn how to pickle and preserve them! Good for the pocket, good for the environment and hugely rewarding for the soul, The Edible Garden provides a taste of the good life to anyone willing to pick up a trowel. Author Alys Fowler can be found on the BBC, and she is obviously a master gardener. She knows a lot about urban gardening, but there is a plethora of information in this book for those who have boundless space to create an edible garden. The photographs in this book are absolutely beautiful, and I especially like the section on edible flowers which fascinate my daughter. In fact, this book has inspired me to devote a whole section of our garden to edible flowers this year. I also can’t wait to try some of the recipes, like the Jerusalem Artichoke Gratin. I never know what to do with the prolific sun chokes! I really love this book and can’t wait to read more that adds to my passion for edible gardens! I cherish this book! Gardening can definitely be tricky, especially for those with little to no experience. I would highly suggest looking into aquaponics for a beginner!